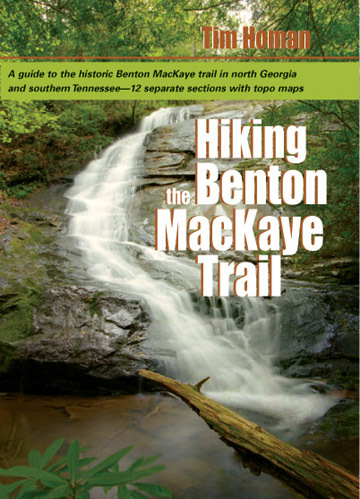 HIGHLIGHTS: The Benton MacKaye Trail and the Duncan Ridge Trail share this in-and-out backtrack route between GA 60 and the Toccoa River and the highlight of this section is an impressive suspension bridge over the river. The Georgia Appalachian Trail Conference and the U.S. Forest Service constructed the 260’ bridge in 1977, and it offers an excellent view of the Toccoa River in both directions. The trail begins near Tooni Gap located on GA 60 at 2,028 feet, and the path heads southbound over Tooni Mountain toward the river. In the first mile, the Benton MacKaye and Duncan Ridge Trails make an ascent of nearly 600 feet up Tooni Mountain (sometimes referred to as Toonowee Mountain on older maps). Tooni Mountain is actually a series of small knobs across a long ridgeline with elevations that range from 2,396 to 2,720 feet. The result is a bouncy ride for hikes and their dogs as they traverse these knobs before the Benton MacKaye and Duncan Ridge Trails make their final descent after 3.5 miles to the Toccoa River at 1,920 feet. At the water, the trail meets the first of several campsites and turns to the right toward the Toccoa River suspension bridge. The gravel Forest Road 816 can be used to save some time and effort on the return trip since it has very little elevation change as it winds back to Tooni Gap. The Kidd and I hiked a 5.6 mile loop that combined the BMT and DMT with U.S. Forest Road 816. The route takes you up and over Toonowee Mountain (2,720 feet), down to the Toccoa River, and back along a valley (and USFS 816) to GA 60. We had lots of ice on our hike, especially on the northern slopes around Toonowee Mountain, and we were surprised to find two other groups camping out in the single digit weather. Nonetheless, we enjoyed the hike and were quite impressed with the engineering that went into the Toccoa River bridge.